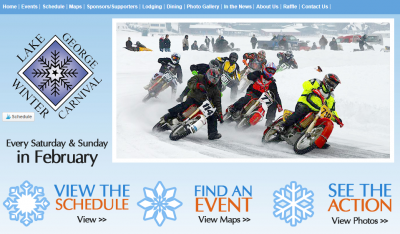 Home > Blog > Lake George Winter Carnival Time! A Full Month of Events, Food and Fun! It’s February – and that means all sorts of old fashioned winter fun in the Queensbury area! During the month of February, the annual Lake George Winter Carnival is in full swing! This yearly event is a traditional festival, planned and put together each year by an all-volunteer committee. The LGWC has been entertaining visitors to the area since 1961 – nearly six decades! It’s a month-long, family friendly winter celebration of the region featuring fun activities like cooking contests, ice sculptures, ATV races, and much more. The Carnival features some high-octane events, including motorcycle, snowmobile, ATV, and even sanctioned car races on the ice. These are ongoing throughout the month of February (see the full schedule here). If the chilly air makes you hungry, don’t worry – the Winter Carnival is also famous for its annual cook-offs! Various local restaurants compete each weekend in chili, barbecue, chowder, and chicken wing cook-offs. Try samples for $5 and vote for your favorite in every category! Don’t forget that the Carnival is ultimately a celebration of winter, and the majority of these amazing events are held outside and on the icy surface of the lake. Dress for the weather! Layer on and bundle up, and bring your scarves, mittens or gloves, and hats. Finally, weather-resistant boots and shoes will keep your feet warm during your walks across the lake and around the village. Looking for more fun things to do while you’re visiting the region? Queensbury is full of great places to eat and shop and exciting wintertime events for the whole family. West Mountain’s annual Fire on the Mountain celebration will take place on Friday, February 15th. Admission is free, and highlights include a torchlight parade, fireworks, food and drink specials, and live music. If you’re looking for a familiar place to eat, chain restaurants in and around the area include Applebee’s, 99 Restaurant, Friendly’s, Golden Corral, Olive Garden, Texas Roadhouse, Panera, and more! Check out the locals’ favorite flavors at spots like Ambrosia Diner, Farmstead Flatbread, and The Silo. 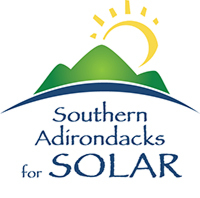 Adirondack Winery is headquartered in Queensbury and is open Monday through Saturday for sales. The Lake George Brewhouse in Queensbury is home to Northway Brewing and features other local brews on tap. Fun Spot roller skating – fun for the whole family! Check out the Outlets for great deals! The famous “million dollar half mile” is a strip of four outlet centers full of recognizable stores and great savings.